The People’s Surge Alliance of Disaster Survivors in Eastern Visayas (People’s Surge), the Center of Environmental Concerns – Philippines (CEC), AGHAM (Advocates of Science and Technology for te People) and the Pambansang Lakas ng Kilusang Mamamalakaya (PAMALAKAYA) are holding talks with the Department of Environment and Natural Resources (DENR) and Department of Public Works and Highways (DPWH) in efforts to stop the Leyte Tide Embankment Project (LTEP), also known as the “Great Wall of Leyte.” The talks were held to stop the project and the displacement of local residents in view of serious gaps and flaws in its technical design. However, AGHAM, CEC, and volunteer experts raise several concerns on the inadequate environmental studies surrounding the project that should ground the design of this massive infrastructural project. Geotechnical expert Ricarido Saturay, Jr. noted that the “storm surge hazard, the central problem being addressed by this project, is poorly characterized.” He said that “the proposed height of the embankment, for one, is placed at 4meters when records show that the Yolanda storm surge rose to at least 6 meters. Coastal processes, including tsunami hazards, liquefaction have not been assessed. Inland flooding is unsystematically discussed. Impacts of climate change on the above hazards are not analyzed by the project’s Environmental Impact Statement (EIS). It is worrisome that the EIS and the ECC of a project of this scale and funded by billions of pesos have been rushed, which is likely to pose more dangers than what the project aims to address. The representatives of the organizations and volunteer experts shared to both departments the results of their environmental reviews and field investigations. According to Frances Quimpo, CEC’s Executive Director, and representative of Community of Yolanda Survivors and Partners (CYSP), “Up to 97 hectares of mangrove forests, swamps and beach forests are threatened to be disrupted, greatly affecting local ecosystems which in turn will affect the livelihoods of the coastal communities. Some of these were products of DENR’s previous mangrove reforestation projects. This is also highly incompatible with DENR Secretary Gina Lopez’s science-based advocacy for mangrove greenbelts as a way of mitigating climate change and enhancing coastal ecosystems. PAMALAKAYA also raised concerns of diminishing access of fisherfolks to fishing grounds, “Our village chapters in the Visayas are in solidarity with the People’s Surge in their opposition of the No Build Zone and No Dwelling Zone policy as this causes immediate dislocation of coastal communities’ main source of livelihood,” said PAMALAKAYA chairperson and former Anakpawis Party-list representative Fernando Hicap. Local communities also raised concerns on the process of the approval of the project since no consultations were held as primary stakeholders of the project. DENR and DPWH said they will look into the matter and that they are willing to work with the organizations and experts to improve the project. “We are challenging the DENR and DPWH to stand true to their mandate of helping communities especially those who have suffered greatly from the effects of the Typhoon Yolanda and are still in need of rehabilitation. Let us not push through with this project that compounds the disaster that we have all managed to survive,,” said by Dr. Efleda Bautista, Chairperson of the People’s Surge. 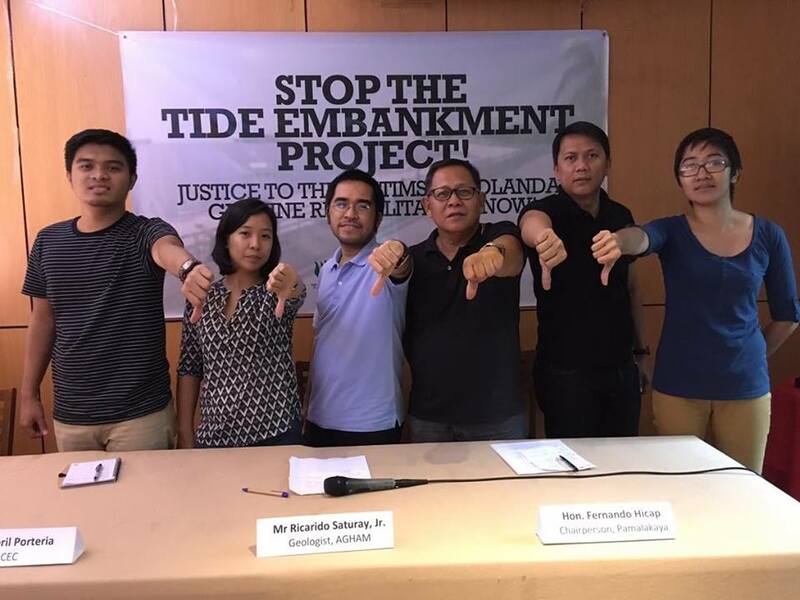 “The Leyte Tide Embankment project is not only a waste of public funds, but also a dangerous proposition, out to compound existing hazards of the coastal communities of the province. We echo the sentiments of coastal dwellers in Leyte to divert the funds instead towards on-site socialized settlements that are resilient and near sources of livelihood, as well as capacity building for disaster preparedness and evacuation centers,” added Quimpo.